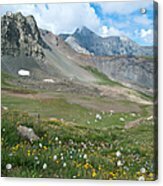 'Sangre de Cristos Meadow and Mountains', a Colorado landscape photograph by Lynn Cyrus / Cascade Colors. This scene is in the Sangre de Cristos range of the Rocky Mountains, in southern Colorado. It features a beautiful summer landscape with rolling alpine meadow dotted with wildflowers, and mountains extending into the background. 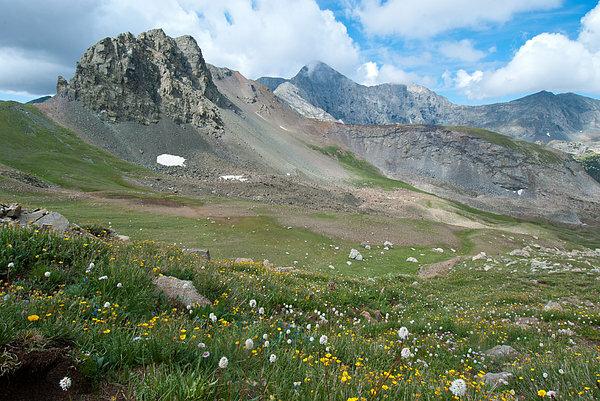 Blanca Peak, a 14er (fourteener) mountain, can be seen in the distance. This photo was taken from Mount Lindsey, another 14er mountain. 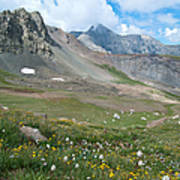 14ers are popular hiking destinations, and are mountains with an elevation of over 14,000 feet.